Micro devices and information technologies have been improved as a result of decreasing the finest manufacturing feature, a lower energy cost and increasing of integration and operating speed. A broad range of microfabrication technologies have been developed for different applications. However, these conventional microfabrication techniques are not suitable for a diversity of nanomaterials and the construction of complicated three-dimensional nanostructures. Laser based micro/nano-manufacturing technologies have emerged in recent years to address relevant issues because of its applicability to virtually all kinds of materials at a small scale down to nanometers. 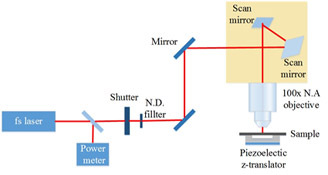 The aim of this paper is to give an overview of various latest laser techniques sorted into four main areas: 1) near field laser fabrication, 2) far field laser interference lithography and laser direct writing for nanofabrication, 3) laser manufacturing of nano materials, 4) stimulated-emission-induced depletion (STED) assisted laser fabrication. The review also covers major progresses achieved by Dr. Anming Hu’s group, such as, femtosecond laser-induced nanojoining, laser exfoliation of porous graphene, nanograting fabricated with laser interference lithography, and microlens femtosecond laser fabrication. We further discuss the challenges in laser based micro and nano manufacturing and present outlook in the near-term development.